We sell Quest products like Natures Aid Odourless Garlic Pearls - 90+30 softgels online in the UK and directly from our award-winning store in Scotland. Garlic may help to maintain a healthy heart and circulation when taken as part of a healthy diet and lifestyle. As official Quest stockist, we sell genuine Heart & Circulation directly from our shop in Scotland and online throughout the UK. Questare proud to offer a full range of outstanding natural products supporting a wide range of health challenges. View more products from Quest. Where can you buy real Garlic Pearls - 120 softgels safely online? 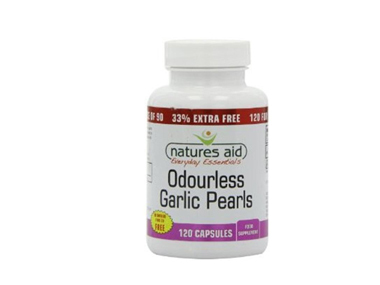 If you are wondering where you can buy Natures Aid Odourless Garlic Pearls - 90+30 softgels safely online in the UK, then shop with us. We are an actual health foods shop; with real people selling real foods and products. Our award-winning independent shop is located in Stirling, Scotland since 1976. You can buy our Acidophilus & Garlic supplements and other genuine Heart & Circulation in store or safely place an order with us online or over the phone. Garlic Pearls - 120 softgels - Natures Aid Odourless Garlic Pearls - 90+30 softgels in Heart & Circulation and Herbal Remedies, Tinctures & Supplements.